As Goya wrote, in a great painting I'd reproduce here if it were possible in Blogger: "the sleep of reason produces monsters...."
I like this... even though I don't get it. Am I ignorant- bc chica, kat and yoga seem to understand. 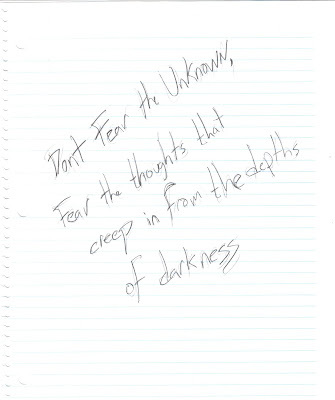 I always thought the Unknown seemed an awful like The Depths of Darkness. So therefore isn't being afraid of both, like, expected? Dont feel ignorant; Ill explain it to ya Brazen with pleasure. What I was trying to get at is fearing the unknown is pointless and there is no reason to fear that which has no bearing on where you stand on what you know. Fearing the thoughts that creep in from the depths of darkness means that those thoughts that creep in from the edge of you mind, drenched in insecurities to stop you from doing things and being true are much more dangerous. Basically its saying, nothing can stop you but yourself. The fear of the unknown is basically you feeding the insecurities thus letting those really dangerous thoughts from the edge of sanity and darkness to creep in and become tangible. So dont fear the unknown, fear those thoughts that can stop you, those thoughts that exist in the depths of darkness of your own mind, fear those thoughts that creep in from behind the curtain of insecurity to change the person who you know you are. I just saw your comment at thisbrazentecher and I wanted to check your blog. Nice, very nice, original and profound - I hate cut and paste blogs- why have a blog if you have nothing to say. I got you on my favorites folder!